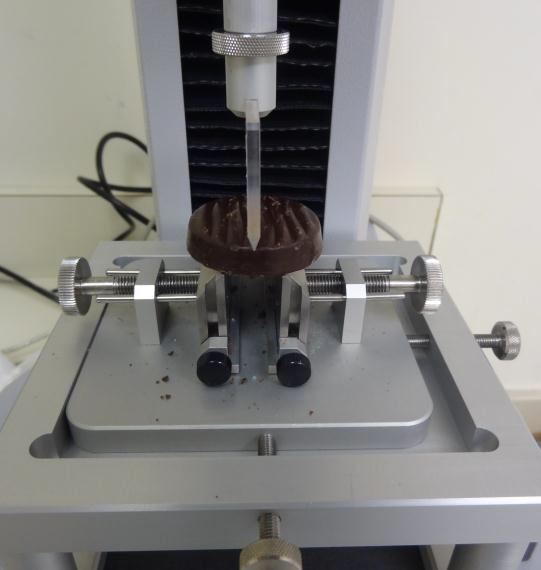 A confectionery processor wanted to measure the effect on the final texture of their chocolate covered mint product when using a sugar substitute in the formulation. 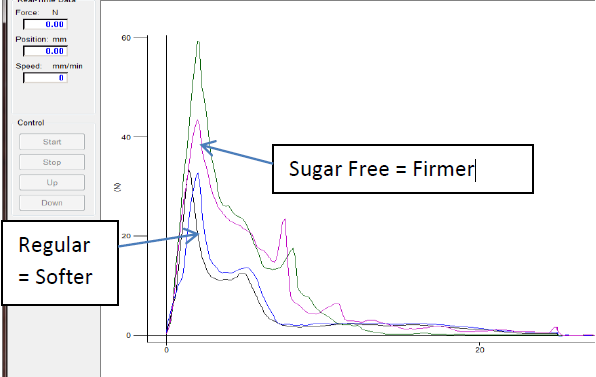 This processor needed a way to objectively measure the final product texture between the regular and sugar-free formulations and be able to show any differences between them. Testing was performed with a TMS-Pro Texture Analyzer, a 100N load cell and a Mini Three-Point Bend Fixture. The program was written to start at zero, run down to sense top of the product before beginning test to compensate for any difference in height of the samples, run down at 500mm/min to 25mm, breaking the candy in half, then return back to zero. The graph to the right shows a vast difference in firmness by the peak forces as well as the area covered. The more area covered by the sugar free mint indicates it had a firmer outside coating as well as firmer inside mint filling that resisted the probe more than the regular mint product.